Peach? These come in peach! That’s unusual and so, I grabbed the peach and popped it into my bag. PEACH! These do smell nicely peach too, opening the package my nose was smacked around by a decent fruit peachy smell. There is not a lot of difference in taste and construction between the peach and the strawberry from yesterday; they are both lightly sweet (unlike the American SUGAR wafers of instant sweet coma), robustly cake cone-y and lightly frosted. The peach flavor is stronger than the strawberry flavor and highly reminiscent of the instant peaches and cream oatmeal packets. I do like the peaches and cream oatmeals. 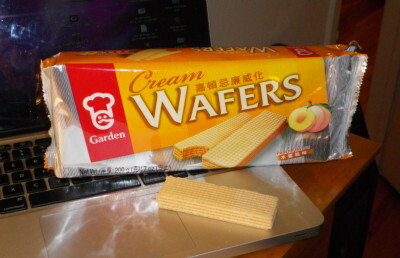 Both wafers are exceedingly crumbly too so prepare to do a bit of clean up after munching.